The Metro series is our #1 recommendation for commuter headlights under $100. 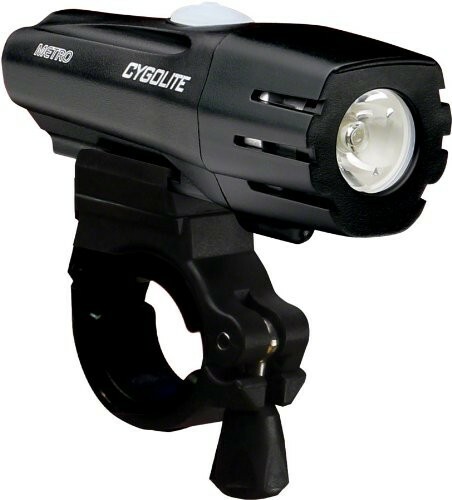 The series is one of my favorites — the lights are just the right size, have Cygolite's special steady-flash pattern which is great for riding at night on city streets and the day-flash mode for 24-hour visibility, and are a great value. I tested a Metro 300, but Cygolite has since released the Metro 360 and Metro 500 with all the same features and brighter emitters. Even at 300 lumens, the Metro 300 was plenty to illuminate dark roads, and the 500 lumen version should be sufficient for moderate off-road riding. Excellent brightness for your money - at around $50, you're unlikely to find a better light for this price. Unique steady-flash pattern (same as described above on the Expilion). The 2013 models (Metro 360 and 500) have a new Day Lightning flash mode that is bright enough to be seen even in direct sunlight. On both models the brightness is boosted to 500-600 lumens in this mode, enabling 24-hour visibility. The 2012 models (Metro 300 and 420) have a solid-flash mode but it's not as bright. Solid construction and easy to use. Same frustrating mount as the Expilion 700.